The Danube river has a beautiful new bridge in Northern Budapest. The building is nicknamed after the American satirist Stephen Colbert and is a good example of public mistrust within the institutions of the Hungarian Republic. There is an expression in Hungarian language: the ‘veterinarian’s horse’. The expression came from the illustration of a 19th century veterinarian book illustration, that depicts all the visible symptoms of a sick horse, even though these cannot be seen on one horse in reality, because each of them would kill the poor animal. The new Megyeri-bridge is very costly and aesthetic building that nobody really wanted to come true in this form. The bridge is part of motorway ring around Budapest that is not agreed to be built. Budapest is an important crossroad in Central Europe, and it is an agreed plan that all the motorway running into the city should have a common bypass, so that the transit traffic do not go through the city. However, there is a strong counter-argument to have 360 degree circle around the city, because the aim can be achieved with a semi-circle without harming the last green areas in North-Northwest to Budapest. The expensive bridge is built to fill the gap in the full circle that may never be finished, and thus at the moment serves very little traffic. The bridge also crosses an island, presently untouched by heavy traffic which contains Budapest natural water reserves. During the planning, there were arguments for and against to allow traffic coming up and down from the bridge onto the island. Heavy traffic by a motorway would change the environment of the traffic, would make it accessible easily from Budapest and would turn to unspoiled island into a new suburb of the metropolis. People who wanted to preserve the island did not want a direct access to the bridge. The two little municipalities of the villages on the island however wanted to have a quicker access to Budapest and the labor market and end isolation. The compromise had been to build the motorway bridge and a small local bridge to serve the municipalities. However, the central government, that is responsible for bridges, did not build the small bridge and have not even given a budget to it. For this reason the small municipalities did not give their blessing to the building permit of the bridge, which was thus finished illegally by the central government. (Similar unresolved disputes remained between the the district of Northern Buda (Óbuda) and Northern Pest (Újpest) and the building authorities of Municipial Budapest). A former economy and transport minister tried to raise public support for the bridge by announcing a naming poll on the Internet, thinking that if we the most popular name will be attached to the not-yet-build bridge, the people will be more attached to the project of the central government. The contest has proven a farce: the most popular suggestions were referring to the bridge’s undecided future and the central government hapless approach to the bridge. The uneasy situation was unlocked by a mediahack from the United States: the American satirist and TV host Stephen Colbert somehow noticed that Chuck Norris took over the lead in the internet vote and urged his fans to vote for Colbert-bridge to avoid another ‘illegible Hungarian name’ and to beat both the central government’s favorite, Miklos Zrinyi, a 17th century Hungarian and Croatian hero, and Mr. Norris, an action-movie hero. Mr Colbert’s fans gave 17 million votes for this proposal and lead to a clear victory. (There are less than 17 million Hungarian speakers in the world, including the diaspora and ethnic Hungarians in Central Europe). The Hungarian governments popular US ambassador, Mr Simonyi announced personally on The Colbert Report that Stephen Colbert had won the vote. Unfortunately for Colbert, Ambassador Simonyi declared that under Hungarian law, Colbert would have to be fluent in Hungarian, and would have to be deceased in order to have the bridge named for him. However, after saying the rules could most likely be bent, he invited Colbert to visit Hungary and view the construction in person and gave him a Hungarian passport and a 10,000 HUF Bill, with an approximate value of, as the ambassador put it, ‘fifty dollars, fifty good US dollars’. Colbert promptly tried to bribe him with said money. The central government than turned to an ‘independent’ scientific linguistic body with the question if Colbert-híd is a possible Hungarian geographical name. The scientist duly played their role, and declared that this is not a Hungarian word, so the government settled with the name Megyeri-híd (Megyeri bridge), referring to the historical name of the neighborhood. Eventually the National Transport Authority came up with a ‘temporary permit’ to allow the ceremonial opening of the bridge, where all the top politicians and the building company were very happy to celebrate this remarkable building. The building contractor has even put on free electric lights to show the beauty of the bridge for the public, although it will pay the electricity bills only for a month. 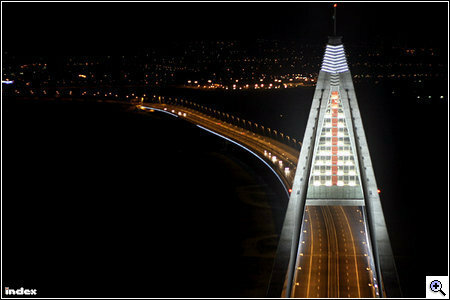 If the the local authorities or the government will fall in love with the night view of the bridge, they will make an offer to provide this service in the long run. Maybe in the meantime it will turn out where you can drive on and drive off from this bridge. The Danube will remain a natural wonder, and the building is indeed probably the most beautiful peace of 21st century Hungarian architecture so far. Update: The Old World New World Yankee has re-posted this and embedded the Colbert-show (that I cannot do here). Another Update: It turns out that the builders left the light on, however, they did not pay the worker’s wage. A beautiful setting for the demonstrations. Love this post! I am an American living in Debrecen, so this totally cracked me up. Thanks for the info. Do you mind if I repost this to my blog? I will of course link to your other posts there, as well as this site. Let me know! Dear NewWrldYankee, go on, spread the news…!